Obama Nation Jan. 20th 8pm @ the Powerhouse!! 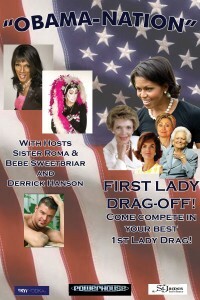 Join Hosts Sister Roma, BeBe Sweetbriar and Derrick Hanson for a fun-raiser of Presidential Proportions with a First Lady Drag Off. Where: Powerhouse 1347 Folsom @ Dore Alley. When: January 20th, after Obama gets sworn in, from 8pm-Midnight.